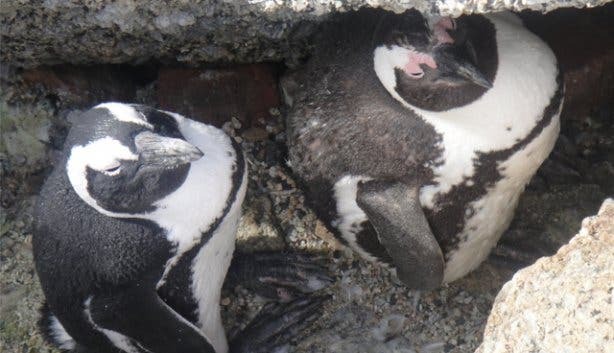 Penguins live almost exclusively in the southern hemisphere, but yes, you will also find them in South Africa, in the seaside village Simon’s Town in False Bay between Fish Hoek and Cape Point - an easy hour‘s drive from Cape Town. 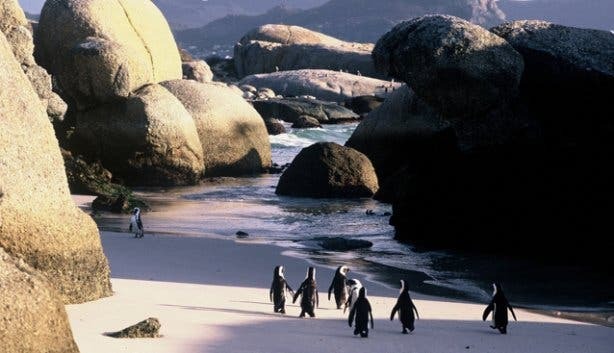 Welcome to Boulders (also commonly known as Boulders Bay), it’s a popular tourist stop because of a colony of African Penguins which settled there in 1982 and the magnificent wind sheltered, safe beaches. 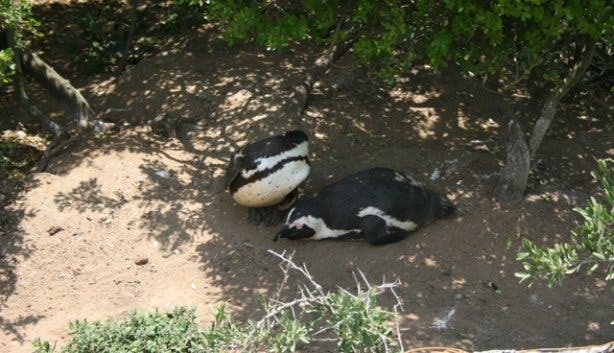 Here, you can spot the African Penguin, also widely known as the 'Jackass Penguin‘ for its donkey-like bray. 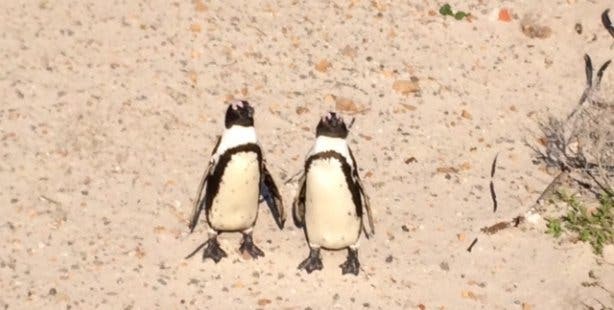 A good way to see the African penguins is from the wheelchair-friendly wooden boardwalk at Foxy Beach that takes you within a few metres of the birds, accessible via the information centre on Kleintuin Road. 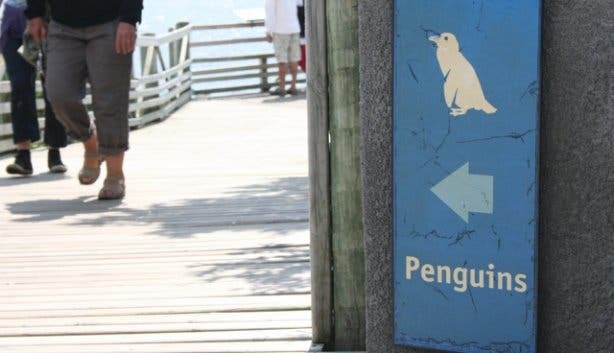 The path next to the Kleintuin Road entrance is also worth a walk, you will spot wandering penguins as well as their incubators.These flightless birds roam freely around the area, so you can get relatively close to them, but please don’t disturb or try to touch them. They can bite – a warning sign is when they move their heads from side to side. You will see indigenous bush above the high-water mark on the one side, and the clear turquoise waters of False Bay on the other. The park is also home to other birds and small mammals, and you may see whales, seals, sharks and dolphins in the bay. 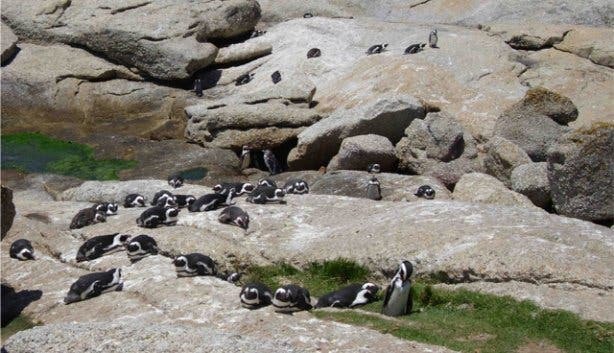 The most popular recreational spot is Boulders Beach. Swim in the comparatively warm and calm waters of the False Bay and relax at the sandy beach; the big round granite boulders are 540 million years old and provide some shade and shelter the cove from currents, wind and large waves; Boulders Beach name originated from the boulders. This beach is great for children - but please always take care. Don’t touch or feed the penguins. Their beaks are as sharp as razors and if they feel threatened they have no qualms about nipping the odd finger or nose. Welcome to paradise! You will find a good amount of restaurants many serving delicious seafood, cute cafés, antique shops, museums and more. Situated in Simon’s Town, which can be reached via the M4 (Main Road) from the city centre, although getting to Muizenberg via the M3 or the M5 are both quicker in travel time. From Muizenberg, the M4 continues via Fish Hoek to Simon’s Town. Take the train from Cape Town to Simon’s Town: Boulders is about two kilometres from Simon’s Town train station, which is the last stop on the scenic Southern Line railway route. Definitely worth the train ride. • Free entry for a year for all Wild Card holders. • In case you need souvenirs for friends and family at home, get them at the Boulders parking area or on your 3 minute walk to the penguins. • The Table Mountain National Park staff is knowledgeable and offer guided tours. Did you know? – Penguin facts. • The African Penguin is listed in the Red Data Book as an endangered species. • Of the 1.5-million African Penguin population estimated in 1910, only some 10% remained at the end of the 20th century. The uncontrolled harvesting of penguin eggs (as a source of food), and guano scraping, nearly drove the species to extinction. More recent threats are oil spills, overfishing of pelagic stocks, unnatural predation by domestic animals and kelp gulls, habitat destructions, climate change. • Because of their donkey-like braying call they were previously named the Jackass Penguin. 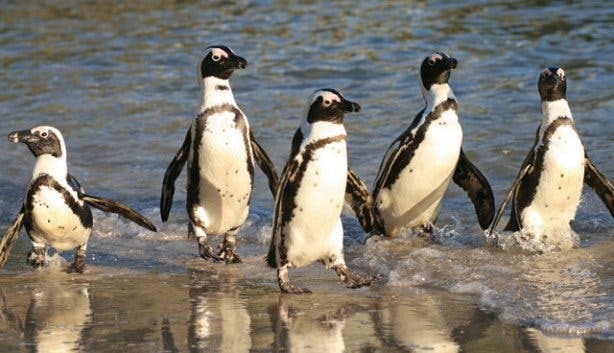 Since several species of South American penguins (also in the Spheniscus family) produce the same sound, the birds have been renamed African Penguins, as they are the only example of the species that breed in Africa. • Their diet consists mainly of pelagic fish such as pilchards and anchovy, but they may consume squid as well. • They can swim at an average speed of seven kilometres per hour, and can stay submerged for up to two minutes. • Their enemies in the ocean include sharks, Cape fur seals and, on occasion, killer whales (orca). Land-based enemies include mongoose, genet, domestic cats and dogs – and the kelp gulls which steal their eggs and new born chicks. • Their distinctive black and white colouring is a vital form of camouflage – white for underwater predators looking upwards and black for predators looking down onto the water. 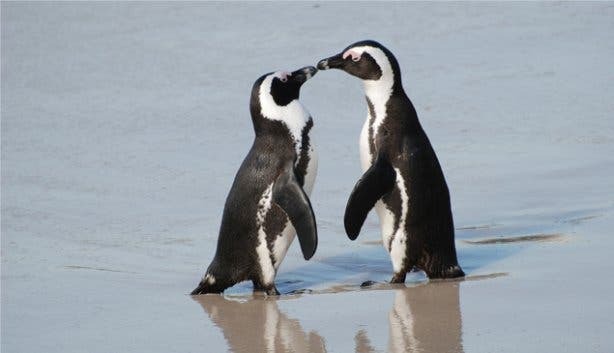 • Although the African Penguin breeds throughout the year, the main breeding season starts in February: most of the penguins stick to the vegetated areas and Foxy beach burrows. 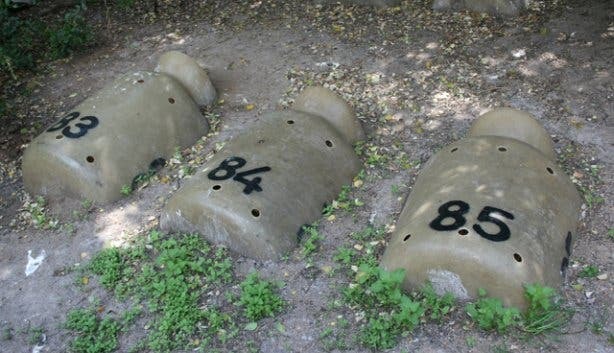 They are a monogamous species and the lifelong partners take turns to incubate their eggs and to feed their young. • For post breeding and pre-moult they head out to sea for fattening up, so very little are on the beach). • Peak moulting time is from October to December, after which they head out to sea to feed (since they do not feed during moulting). They return in January to mate and begin nesting from about February to August. During moulting they lose their feathers and look 'sad and stressed' as some would say, this is the starvation period. • Mating season (December – February) is the best time to view the birds and their natural behaviour, however it is very hot and windy this time of year so visitors must come prepared. • Best time to photograph is early morning and late afternoon as the penguins leave to go to sea or come back from feeding. Find out more about South Africa's National Parks in the Western Cape. Also, check out luxuary at its finest at aha The Quayside Hotel. For all things Cape Town subscribe to our popular newsletter and connect with us on Facebook and Twitter.